Although less well known than the Montessori education philosophy, Waldorf is an alternative education system which focuses on the holistic development of a child. As their website states, Waldorf schools integrate artistic, practical and intellectual content in their curriculum and focus on social skills and spiritual values. Waldorf education first began in 1919 when the first school was opened in Germany to cater to the children of the employees of a cigarette factory (Waldorf Astoria Cigarette Company). It was inspired by Rudolf Steiner’s philosophy. Steiner believed that children learned best when they were encouraged to use their imagination. He argued that education had to take into account physical, behavioural, emotional, cognitive, social, and spiritual aspects of each child. The research on the real impact of Steiner schools has remained inconclusive because of small-scale studies and the inability to generalize data. The schools have also been criticized for focusing on weaker students and overlooking the needs of more talented students. However, many benefits have been associated with a Waldorf education. The book Alternative Education for the 21st Century provides evidence that Waldorf schools indeed enable the holistic development of children. Other studies have found that children enrolled in Waldorf schools are more eager to learn new things, have more fun in school and have a more optimistic view of their future than children enrolled in state schools. A recent study conducted in Germany found that children in Waldorf schools complained less about ailments such as headaches, stomach aches and poor sleep. Yet another study that compared the drawings of children in Waldorf schools, Montessori schools and traditional schools found that children following a Waldorf education were more organized and had more imaginative and detailed drawings. Steiner once said “Where is the book in which the teacher can read about what teaching is? The children themselves are this book. We should not learn to teach out of any book other than the one lying open before us and consisting of the children themselves”. Children do not all develop in the same way, nor do they develop at the same rhythm. Waldorf education teaches us to be attentive to the needs of each individual child and to stop expecting our kids to be what they’re not. It is said that Einstein once said “If you want your children to be intelligent, read them fairy tales. If you want them to be more intelligent, read them more fairy tales.” Waldorf education shares this view. Rudolf Steiner believed that storytelling was a gift, and storytelling has remained a central feature of Waldorf education. Stories help children to connect, they teach them new words, and they take them to places they’ve never been. Waldorf education emphasizes the importance of telling stories rather than reading stories. Storytelling builds a child’s imagination. Making up stories can be difficult but it gets easier with time. You can also tell simple stories you remember from your childhood. Going through the story before you tell it will make the storytelling experience more fulfilling for both you and your child. Young children like to listen to the same story several times so they’ll be happy with the same story repeated for a while. Children thrive on physical activity. Playing outside also spurs their creativity. Connecting with nature means teaching our children to be more attentive to the world around them. It means teaching them to take the time to smell the flowers and observe the different things and people in their environment. Nature also has a calming effect on children. Opportunities to connect with nature abound: smell flowers, pick flowers, collect pebbles, take pictures of insects, pick leaves, paint or draw still life objects, play with sticks, build forts, dig, play with sand, scavenger hunts, etc. Waldorf education is based on the principle that the simplest toys foster the greatest creativity. Steiner emphasized the need for the most natural toys and argued that toys should provide children with sensory experiences. He believed that when toys are simple and open-ended, they spark children’s creativity because children can then use their imagination to create other objects. 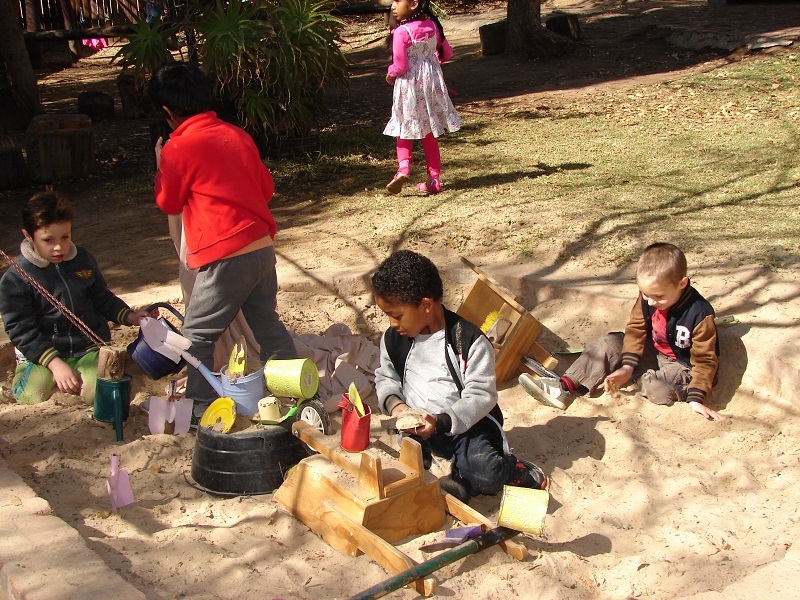 Waldorf education favours simple and eco-friendly toys to which everyone has access: pinecones, shells, acorns, yarn, silk rags and handkerchiefs, sticks and branches, wooden blocks, acorns, stones, cardboard etc. In Waldorf education, each morning begins with “circle time”. Circle time is a special moment during which children come together to sing, recite verses, do movement exercises, and do finger plays based on specific themes (for example seasons). There are many benefits to establishing routines. The authors of the book “Simplicity Parenting” (incidentally, one of the authors is a Waldorf educator) are convinced that rituals and routines give children a sense of security and provide them with roots. They believe that establishing routines can simplify parenting and make parenting a more fulfilling experience. Art is an important aspect of Waldorf education. Making room for art means providing our children with unstructured moments in which they can practice creative play. It is in these moments that they develop their creativity. Steiner believed that fewer and simpler toys helped children develop greater creativity. He also believed that organized spaces (toys arranged tidily in baskets or shelves rather than in piles) played an important role in child development. The importance of organized spaces is an aspect shared by Montessori schools.